Late Medieval to Post Medieval copper alloy mount, 41mm in length, 35mm wide and 3mm thick with a weight of 14.58grams. 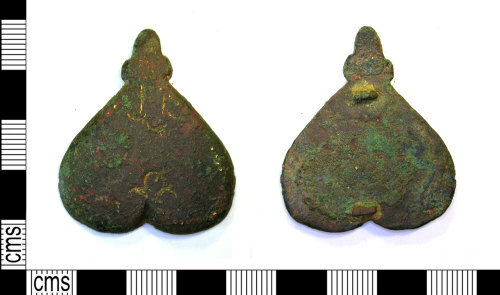 The object is 'heart' shaped (triangular with a double curved upper edge) with a rectangular cross section. The pointed part terminates in a flat acorn shaped knop. It has gilded stamped decoration, formed of a border of circular stamps along its edge and an open trefoil of circles sitting below the dip in the curved edge. The opposite side by the terminal has a rectangular motif with crescents below. The reverse houses the remnants of two rectangular fixing prongs, whose form and alignment suggest they were part of a rectangular bar. suggested date AD 1400-1800.